Reconstructions of past climate show notable temperature variability over the past millennium, with relatively warm conditions during the Medieval Climate Anomaly (MCA) and a relatively cold Little Ice Age (LIA). 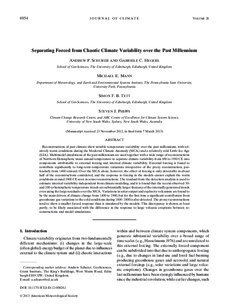 Multimodel simulations of the past millennium are used together with a wide range of reconstructions of Northern Hemispheric mean annual temperature to separate climate variability from 850 to 1950 CE into components attributable to external forcing and internal climate variability. External forcing is found to contribute significantly to long-term temperature variations irrespective of the proxy reconstruction, particularly from 1400 onward. Over the MCA alone, however, the effect of forcing is only detectable in about half of the reconstructions considered, and the response to forcing in the models cannot explain the warm conditions around 1000 CE seen in some reconstructions. The residual from the detection analysis is used to estimate internal variability independent from climate modeling, and it is found that the recent observed 50- and 100-yr hemispheric temperature trends are substantially larger than any of the internally generated trends even using the large residuals over the MCA. Variations in solar output and explosive volcanism are found to be the main drivers of climate change from 1400 to 1900, but for the first time a significant contribution from greenhouse gas variations to the cold conditions during 1600–1800 is also detected. The proxy reconstructions tend to show a smaller forced response than is simulated by the models. This discrepancy is shown, at least partly, to be likely associated with the difference in the response to large volcanic eruptions between reconstructions and model simulations.